Margin of Eros is a humorous urban fantasy novel by Clare Hawthorne. The story combines the modern day mayhem of human life in California with the busybody lives of the Greek gods of Olympus, who are feeling a little forgotten amid the hurly-burly of contemporary life. The action switches between a variety of characters, from catty goddesses such as Hera and Aphrodite to Eros and Hermes, who have their own playful agendas once on Earth, and the intrusion of a hippy-like version of Jesus of Nazareth into the plot. The primary human character is Violet, who gets embroiled in the petty games and squabbles of the gods and has a very hard time getting out again. Clare Hawthorne’s prose is witty, and I very much enjoyed her slick, modern day versions of the characters we know so well from ancient Greek mythology. Margin of Eros is very much a character ensemble piece which sets out scenes for laughs and the occasional over-descriptive love scene, and it does a good job of satirizing the Californian way of life, and the general shallow nature of humankind. The thing that prevents it being a five star read for me is that the plot didn’t really go anywhere; it’s very much a collection of amusing events that don’t appear to culminate. Overall, though, I’d recommend this book to chick-lit fans looking for something genuinely funny and a little bit different to their usual contemporary drama reads. 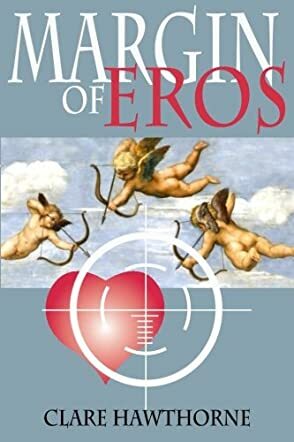 Margin of Eros is a quick and stylish read, sure to make you smile. What happens when the Greek gods start to get a little bored with their everyday lives? There are actually far too many gods wandering around the world, wreaking havoc on the lives of unsuspecting mortals. Ares, Hermes, Eros and even Aphrodite are attempting to change the fates of several people throughout Hollywood, and one of them, Violet, is definitely more than a little on their radar. The most beautiful mortal in more than a few centuries, Violet has drawn the admiration of the most well-known gods of the time, but the ire of the beautiful Aphrodite. When she starts enacting her own plans to take revenge on the poor woman who’s unfortunate enough to catch her lover’s eye, things really start to get a little crazy. Margin of Eros by Clare Hawthorne is an interesting story for those who love the quirky side of life. This book is great for anyone who loves mythology. I can’t get enough of Greek gods so, when I read the summary for this book, I definitely had to have it. I like the way the characters are developed and the way that they continue to evolve. They are very interesting and the gods really seem almost real. I enjoyed the overall layout and the plot. Who doesn’t love a great story with magic, mystery and more than a little romance? I was really impressed with the plot and how each of the characters was able to accomplish goals in Margin of Eros by Clare Hawthorne.